At Skyline Cruises, we sail past history every day. We’re located in the greatest city in the world and you won’t go too long on any of our cruises without viewing an iconic site. Many of those sites are also historic. New York City is filled with a rich history and the buildings, landmarks and waters all have stories to tell. We’d like to share some of those stories and what better place to start than where the majority of Skyline’s cruises start, at the historic World’s Fair Marina in Queens. 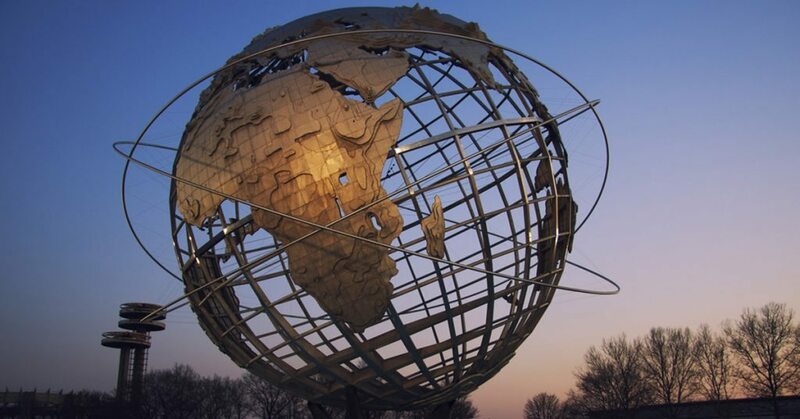 It’s played a role in two World’s Fairs and the site has seen many significant events in New York City. Here’s a look at the history of our home port. Please note, that we’re expecting renovations to be done at the World’s Fair Marina in Queens during the first quarter of 2017. Please check with Skyline for more information and the location of your departure. Although the World’s Fair Marina didn’t get that name until the 1964 fair, the recorded history associated with the site dates back to the 17th Century when Dutch Settlers established the settlements of Newtown and Flushing, according to the New York City Parks Department. During the American Revolution, the area was occupied by British forces who worked out of the Lent Farmhouse, named for one of the area’s early settlers. After the Civil War, Flushing Bay became a popular resort area including a hotel on the marina’s site erected by notorious concert-saloon (a forerunner of modern night clubs) keeper Harry Hill, who ran a steamboat between this saloon and one on Houston Street in Manhattan. The area declined in the late 19th and early 20th century until the area became mostly an ash dump. But the idea of re-developing Flushing Meadows began to take shape in the 1920s and 1930s. The Grand Central Parkway was built in 1922 to connect Queens Boulevard with Nassau County, according to the Kew Gardens Civic Association. The driving force behind the project was Parks Commissioner Robert Moses, who also looked at plans to bring the World’s Fair in New York as an opportunity to extend the Parkway and replace the former ash heap with a park. The result was a fairground that covered 1,216 acres when it was opened by President Franklin Roosevelt on May 30, 1939, according to 1939nyworldsfair.com. One of the improvements made as part of the massive construction project was a boat basin. That basin was renamed the World’s Fair Marina when the fair returned to Flushing Meadows Corona Park in 1964. Moses envisioned a marina that would “be the boatman’s gateway to the city…another example of successful Federal, State, City, World’s Fair and private cooperation,” according to the Parks Department. When the project was finished there was space for 800 boats. After being managed by private concessionaires, the City Parks Department took over the facility in 1999. Skyline Cruises has called the marina home since 1993 and we’re proud to be a part of the area’s rich history. If you’re looking to make your celebration or event memorable, consider a private charter with Skyline Cruises. Our climate controlled ship sails in all types of weather. We’ll give you a view of New York City’s iconic sites capped off by a close-up look at the Statue of Liberty. For more information, contact Skyline today!